Berlin, August 21, 2013 - John Deere 5G Series tractors for 2014 feature new Stage III B engines on selected models, as well as a brand new low-profile 5GL model. First introduced in 2009, the 5G Series is positioned between the 5E and 5M Series tractors to meet the needs of smaller arable, livestock, mixed and speciality farms. The 5G models can also be used as year-round workhorses by local authorities and groundscare contractors, for example. Their combination of compact, lightweight design and new premium features ensure that the latest models can handle an equally wide range of jobs. The new 80 and 90hp 5G Stage III B Series tractors will be available in both cab and open operator station versions, with either two- or four-wheel drive. As a result, these versatile tractors can be used anywhere from small yards and low barns to large fields. Equipped with equal front and rear wheels in the four-wheel drive version, the 90hp model is also available as the 5GH, which offers a high ground clearance of 0.78m in its two-wheel drive configuration. The ground clearance allows this tractor to operate in low height crops such as vegetables and soft fruit, as well as vineyards. The new 5G and 5GH Series tractors feature powerful four-cylinder 3.4-litre diesel engines equipped with a common rail system, efficient charge air cooling and a turbocharger to comply with Stage III B emission regulations. With a constant power range of 400rpm and a torque rise of 31 per cent, this new engine ensures the appropriate levels of power, performance and productivity for a wide range of operations. The intelligent power management (IPM) option on the 5090G provides an additional 9hp at 2300rpm and a power bulge of five per cent for PTO and transport applications. Additional versatility is provided by a choice of 540/540E and 540/1000rpm PTO speeds and the optional ground drive PTO, which is more suitable for trailer work. Featuring an engine driven tandem gear pump, the open centre hydraulic system on 5G Series tractors provides ample power. One pump is dedicated to the steering and braking systems, while the second is devoted to the selective control valves (SCVs) and rockshaft for uninterrupted steering and hitch movement during simultaneous use. An optionally available third pump offers an additional 29.8 litres/min dedicated to the rockshaft and SCVs, for customers demanding more from their hydraulic system. In this case a total output of 126.4 litres/min can be achieved. Up to four standard or four optional electro-hydraulic SCVs give the operator excellent control of the hydraulic system. Electro-hydraulic activation of the SCVs is at the push of a button. The three-point hitch on 5G Series tractors provides a standard maximum lift capacity of 2700kg at the ball ends. For more versatility and to operate bigger implements, additional lift cylinders are available to extend the maximum lift capacity to 3200kg. The new 5G Series can be ordered with a factory installed front PTO and front hitch. 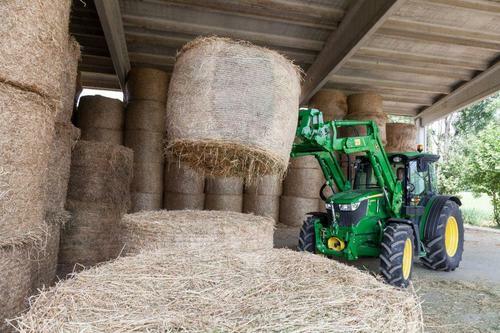 In addition, a new ‘front loader ready’ option is available for easy integration of John Deere’s new, smaller H240 and H260 front loaders. A redesigned, sealed and pressurised cab has also been developed to provide the operator with the best possible level of comfort and protection while working in the field or driving on the road. While John Deere’s existing 5G Series speciality tractors the 5GF (fruit/orchard version) and 5GV (vineyard version) continue to feature Stage III A engines and are designed to operate in narrow environments, the low-profile 5GL model represents an entirely new design and will be available with a range of customisable options.